Police investigating failed car bombings in Glasgow and London have detained a man at Brisbane airport. Australian media reports have identified the man as Dr Mohammed Haneef, aged 27, who was detained while trying to board a plane to India. It brings the number of people held to eight. In addition, Australian police are interviewing a second doctor. Two men arrested in Scotland on Monday over the Glasgow attack are being handed over to the Metropolitan Police. Controlled explosions have been carried out on a car at a Glasgow mosque and at a station in Hammersmith, west London. British Transport Police said explosives experts performed a controlled explosion on three fire extinguishers left on a pavement outside Hammersmith Tube station, which serves the District and Piccadilly lines. Three explosions were also carried out on the car in Glasgow as a precaution, but Strathclyde Police said there had been "absolutely no specific information" regarding a threat. Australian Prime Minister John Howard said Australian police there had acted on information from the UK authorities. The man detained at Brisbane airport was an Indian national who had been trying to return to India with a one-way ticket, he added. Australian Attorney-General Philip Ruddock said police had executed search warrants at the Gold Coast Hospital in Southport, eastern Queensland - where the detained doctor worked as a registrar - and at other locations across the state. Queensland Premier Peter Beattie said the detained man had been working at the hospital since September, and that he had been based in Liverpool when he answered an advert in the British Medical Journal in March 2006. Dr Haneef is known to have previously worked at Halton Hospital in Runcorn, Cheshire. Mr Beattie said a second doctor, also recruited from Liverpool, was being interviewed by police. In Scotland, the Lord Advocate approved the transfer of two men, who had been held in a high security police station in Govan, to the Met. Speaking at a Muslim Council of Britain press conference, Dr Muhammed Abdul Bari said those who sought to kill or maim innocent people were "enemies of all of Muslims and non-Muslims". He reiterated the government's view that it was "unacceptable to hold any one faith group or any community as being somehow collectively responsible for the actions of the few". Meanwhile, it is understood Iraqi Bilal Abdullah - a doctor arrested at Glasgow airport on Saturday - is to be taken from Scotland to Paddington Green police station in London. Another man detained at Glasgow airport along with Dr Abdullah suffered severe burns and remains in a critical condition under armed police guard at the Royal Alexandra Hospital in Paisley - where Dr Abdullah was employed as a locum. A fourth doctor, Mohammed Asha, 26, is also being held at Paddington Green. Dr Asha, who was brought up in Jordan and worked as a junior doctor at the Royal Shrewsbury Hospital and the Princess Royal Hospital in Telford, was arrested on the M6 in Cheshire on Saturday night along with a 27-year-old woman thought to be his wife. Two men, aged 28 and 25, were arrested on Sunday at residences of the Royal Alexandra Hospital and another man, aged 26, was arrested in Liverpool on Sunday. Dr Abdullah is said to have qualified in Baghdad in 2004 and first registered as a doctor in the UK in 2006. It has emerged that detectives visited a taxi company in Paisley six hours before the Glasgow attack on Saturday to search for details about Dr Abdullah, who had used cabs to go to work at the Royal Alexandra Hospital. Taxi firm owner, Denis O'Donnell, said police had come to his office on Saturday morning to look through records to find out more about Dr Abdullah's movements. This follows the news that police also tried to contact a letting agent in Paisley the same afternoon asking for information about the suspected plotters. Detectives are trying to trace the movements of the green Jeep Cherokee - registration L808 RDT - loaded with gas cylinders, which crashed into the doors of Glasgow airport's main terminal and burst into flames on Saturday afternoon. The attempted attack came a day after two Mercedes containing petrol, gas cylinders and nails were found outside a nightclub in London's Haymarket and in a nearby street. Home Secretary Jacqui Smith said 19 locations had been searched by police investigating the attacks. These included properties in Houston, near Glasgow; Merseyside and two addresses in Newcastle-under-Lyme, Staffordshire. 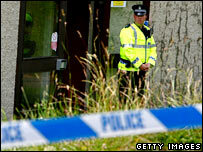 Police are also searching Dr Asha's office at the University Hospital of North Staffordshire, in Stoke-on-Trent. Police have urged anyone with information to phone the confidential Anti-Terrorism hotline number on 0800789321. Have you been affected by this story? Contact us using the form below. Send your pictures and moving footage to yourpics@bbc.co.uk or text them to 07725 100 100.